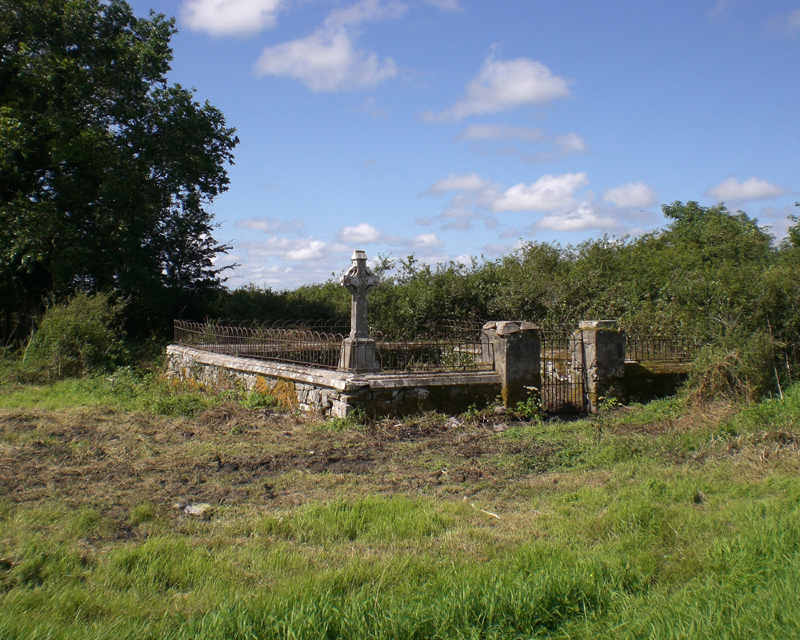 An Curraghaun Historical Site – Windfield Demesne. The Curraghaun is an extremely significant site, and not just locally but nationally and internationally as well and it gets its title from the gaelic word ‘curraghaun’ which translates as a ‘small moor or place of heather and heath’’. There are three very distinct activities that can be confirmed as taking place here. Firstly, and very significantly, it contains a childrens burial ground, or Cilleachan as it is known . 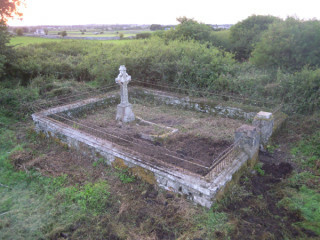 These ‘Cillini’ were resting places for individuals considered unsuitable for burial within consecrated ground by the Church and traditionally associated with the burial of infants primarily, though not exclusively, who had died before they were baptised. In today’s society we would probably rank this as one of the saddest of all of our ancient customs and how it dealt with the death of our babies and our young children and furthermore that they could only be buried in our darkest hours after sunset and before sunrise and typically outside the walls of a graveyard, in a disused graveyard, a cilleachan or a ring fort and indeed many families from the locality would have relations buried here in the Curraghaun. Secondly it is the site of the grave of James Francis Jameson of Windfield Demesne who died in 1896 and who was the son of Reverend John Jameson and great- grandson of John Jameson the founder of The Jameson Distillery in Bow Street in Dublin. The Jamesons were landlords over seven townlands from 1820 – Mullaghmore North, Mullaghmore South, Mullaghmore East, Mullaghmore West, Windfield Lower, Windfield Upper and Windfield Demesne and the latter was also the location of their main residence and while the ‘big house’ is no longer standing many of the remains of this vast estate are still visible and in everyday use. James Francis Jameson’s burial place is marked by a granite Celtic cross headstone, with inscriptions, and the grave surround is identified by limestone kerbing. These in turn are surrounded by a dry limestone wall with concrete capping and wrought iron railings with a wrought iron gate entrance. James Frances Jameson’s wife, Helen Maud Jameson, who was also his first cousin, perished on the City of Dublin Steam Packet Company mail steamer, RMS Leinster, in the Irish Sea on October 10th, 1918 when it was sunk by a torpedo from German submarine UB-123 while bound for Holyhead. Thirdly, and perhaps the least obvious to the human eye, this site was most likely the location of a monastic enclosure that would likely have been there even before the children’s burial ground. The rectangular remains of three buildings are evident, and there may be others, and they indicated a settlement of this nature given their size and the subsequent selection of this area of the purposes of burials. This particular area was surveyed in detail by eminent local historian Dr. John A. Claffey M.A., Ph.D. and the above were his observations and he does strongly suggest that this area is clearly worthy of further investigation. The remains of the original Curraghaun site boundary wall also exist and these are of a very irregular shape and are clearly marked in the very first ordnance survey maps of the locality carried out from pre-famine times of 1838 to 1842. There does not initially appear to be any particular reason for its irregular shape as this is quite unusual. 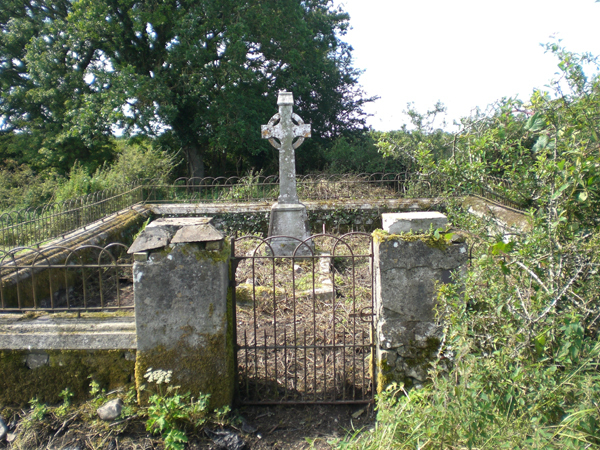 The site is on the property of the Mannion family of Windfield Lower and they are always most welcoming and accommodating to visits to assess the site and would be very supportive of any improvements, developments or enhancements that may be possible. It was important to open this to the wider public and it is hoped that some funding might be forthcoming for general access and site development, assessment and protection into the future. I have a question for the photographer of the photos. Are you any relation to Thomas and Nora Leonard Laffey? HIs father was Patrick Laffey. Children: Esther, Mary, and Thomas. Nora was from Windfield Lower, Moylough Parish. Please email me if you are related or familiar. Thanks!